Just a quick update on the progress of the new pendant for Mach3 that I am working on. 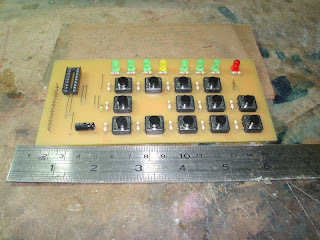 The PCB has been completed and populated as shown on the right. The empty socket is meant to hold the PIC microcontroller to manage the quadrature signals to the parallel port. This pendant requires a total of 13 input/output so a second parallel port will be totally used up.